The USBG-7U2ML is designed to provide quick and easy access to your USB devices. It provides seven type “A�? downstream ports for connecting USB peripherals, devices, or other USB hubs. A single type “B�? 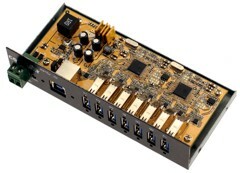 upstream port connects the USBG-7U2ML to the host computer or another USB hub, enabling up to 127 devices to be connected by cascading multiple hubs. Configured directly by the operating system, the USBG-7U2ML operates seamlessly with both Microsoft Windows and Apple Macintosh Operating Systems.